I admit it. Trekking up Machu Picchu wasn’t as easy as I thought it’d be. It was a painful task and to think if I’d kept up with my traveling partners (a Swiss and Dane) I could have reached the heights of Waynapicchu and had a great view of everything. But I was quite content with doing it moderately, because we started our ascent at 4am and I could barely see the steps in front of me. Luckily, I made it up to the lost city of the Incas before sunrise to watch one of the most spectacular and memorable events of my life. 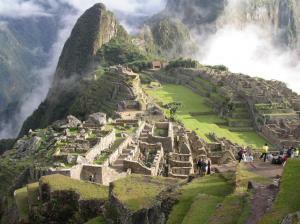 Peru, in general, I found to be overly touristic, catering too much to westerners. While Lima reflects the disparity between “have” and “have-not” more than any other capital city in South America. I walked from the beautiful ocean-front Miraflores to Centro Lima where I was shocked to see what José Carlos Mariátegui called “Peruvian reality”. However, I did love Cusco and its Inca-built foundations around the city. Makes you realize what kind of amazing feats this ancient civilization accomplished. Bolivia, on the otherhand, is still untouched for the most part. Being one of the poorest countries in South America it holds on to its character. La Paz is an interesting city, even when you approach it from El Alto, coming down from dizzying heights, you literally feel breathless. Once in the city, after visiting the Witches Market (or as I like to call it ‘tourist trap’) there’s absolutely nothing! I took some time to get acquainted with their national crop the coca leaf, visiting the Museo de la Coca, where I learned a little more about its uses, other than cocaine, and how many cocaleros (Bolivian coca farmers) fight its eradication due to the U.S. ‘war on drugs’. Today I arrived in Mancora, Peru. This is my last stop on the ‘Gringo Trail’ before veering off into Ecuador, where I’ll likely visit Quito before moving on into Bogota, Colombia.